Tidally locked in synchronous rotation, the Moon always presents its familiar nearside to denizens of planet Earth. 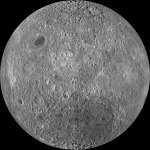 From lunar orbit, the Moon's farside can become familiar, though. In fact this sharp picture, a mosaic from the Lunar Reconnaissance Orbiter's wide angle camera, is centered on the lunar farside. If you could stand on Mars -- what might you see? If you were the Curiosity rover, then just last month you would have contemplated the featured image -- a breathtaking panorama of the lower portion of Mount Sharp. The colors have been adjusted to mimic lighting familiar to Earthlings. For reasons unknown, NGC 6357 is forming some of the most massive stars ever discovered. This complex wonderland of star formation consists of numerous filaments of dust and gas surrounding huge cavities of massive star clusters. The intricate patterns are caused by complex interactions between interstellar winds, radiation pressures, magnetic fields, and gravity. Sculpted by stellar winds and radiation, a magnificent interstellar dust cloud by chance has assumed this recognizable shape. 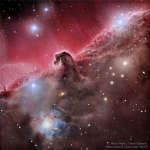 Fittingly named the Horsehead Nebula, it is some 1,500 light-years distant, embedded in the vast Orion cloud complex. Once upon a solstice eve a little prince gazed across a frozen little planet at the edge of a large galaxy. The little planet was planet Earth of course, seen in this horizon to horizon, nadir to zenith projection, a digitally stitched mosaic from the shores of the Sec reservoir in the Czech Republic. Looking out the window of an airplane, you might be lucky enough to see "the glory" in the direction directly opposite the Sun. Before airplanes, the phenomenon, known to some as the heiligenschein or the Specter of the Brocken, was sometimes seen from mountaintops.